Removal ProcedureRemove the control valve body cover. Refer toControl Valve Body Cover Replacement. Disconnect the input speed sensor electricalconnector-(1).Disconnect the output speed sensor electricalconnector-(2).Disconnect the shift position switch electricalconnector-(3). 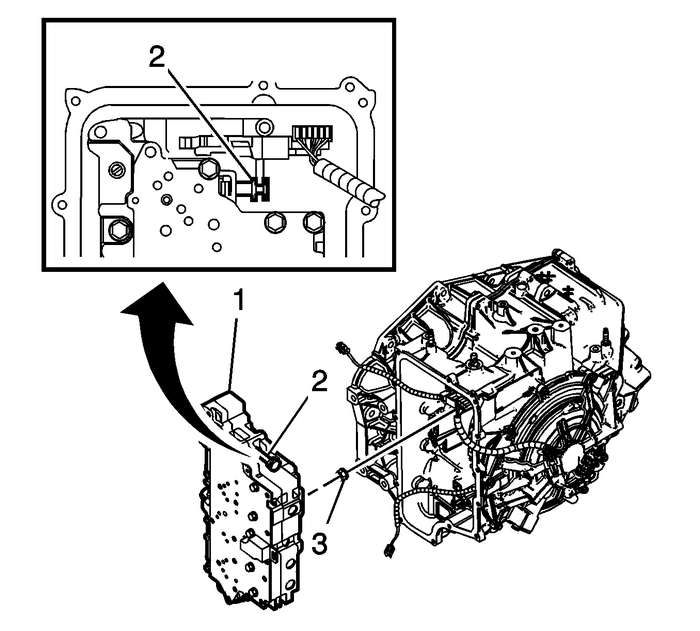 Remove the 4-control valve bodybolts-(1) M6-x-80.Position the control solenoid valve spring-(8) tothe side. Spring will be released with removal of lower controlvalve body.Remove the 2-control valve bodybolts-(4) M6-x-65.Remove the control valve body bolt-(3)M6-x-42.Remove the 3-control valve bodybolts-(2) M6-x-95.Remove the control valve body bolt-(7)M6-x-55.Remove the control solenoid valve body and transmissioncontrol module (TCM) assembly-(5). 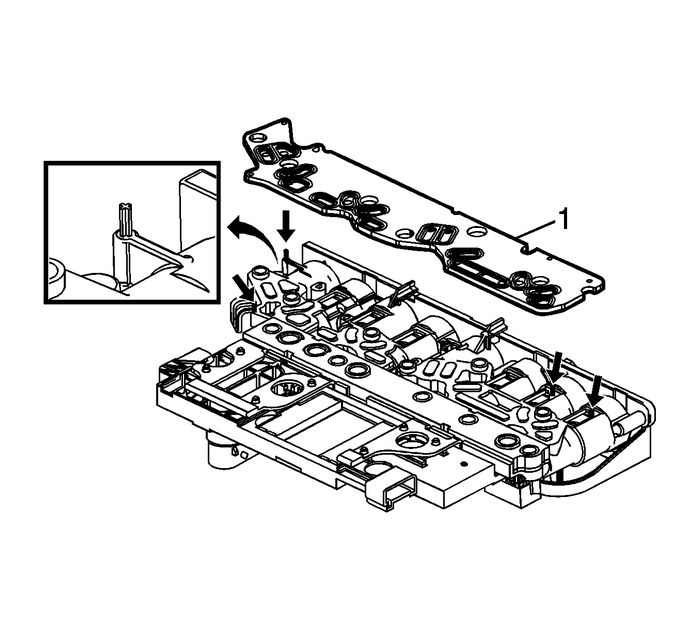 Remove the control solenoid valve body assembly filterplate-(6).Discard the filler plate. 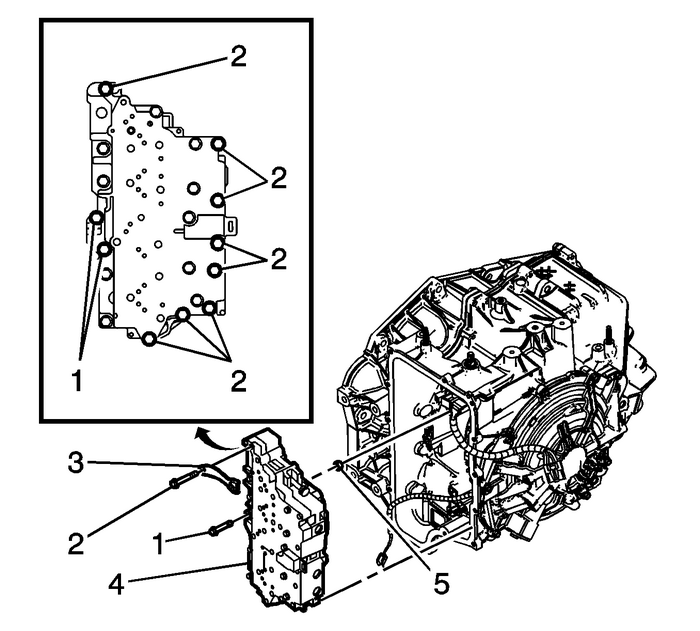 It is not reusable.Inspect the pressure switch manifold seals for damage orcontamination. Replace the control solenoid valve assembly asnecessary.Inspect the upper channel plate bolt holes for damage,peening or burnelling. Any damage around the bolt holes near thePCS switch feed holes could cause leakage around the PCS switchseals. Replace the upper channel plate as necessary. 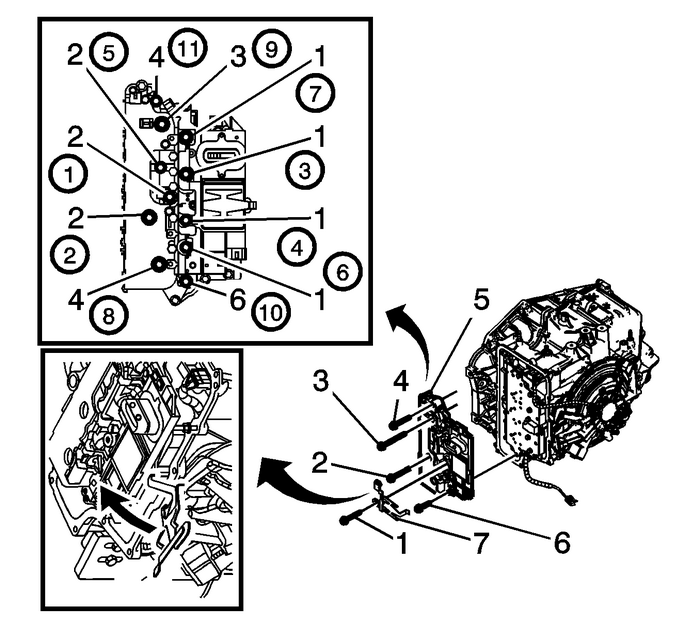 Remove the 8-control valve bodybolts-(2) M6-x-65.Remove the 2-control valve bodybolts-(1) M6-x-55.Remove the manual shaft detentassembly-(3).Remove the control valve body assembly-(4).The control solenoid valve spring can now be fully removedfrom the lower control valve body assembly. Note:The clutch fluid passage seal is not reusable. 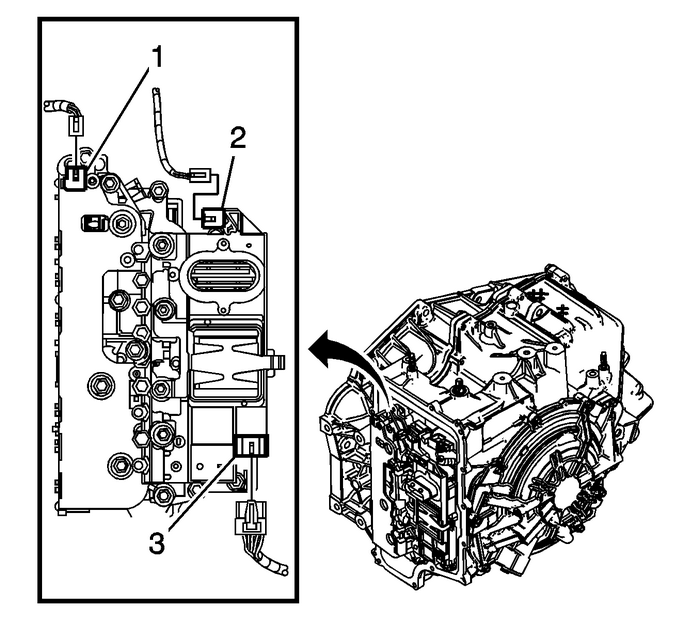 Install a NEW1–2–3–4-clutch fluidpassage seal-(3). 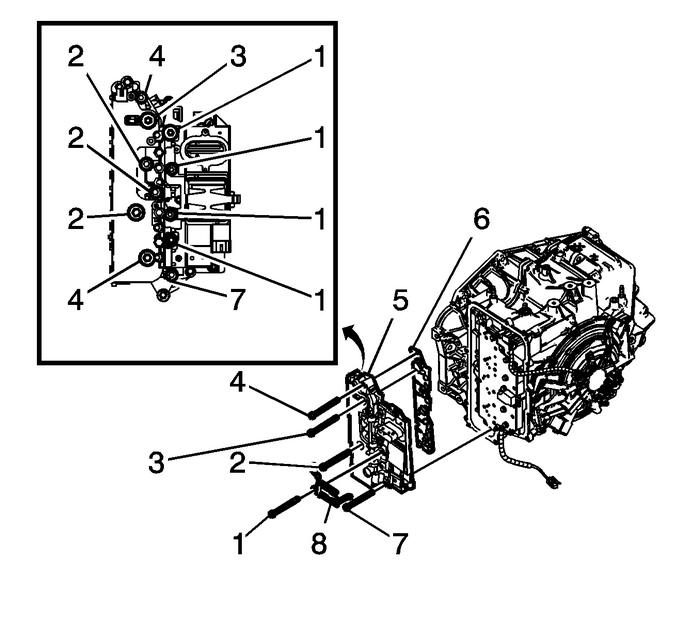 Ensure the control solenoid valve spring is attached to thelower control valve body assembly.Align the manual valve-(2) to the detent leverassembly while installing the lower control valve bodyassembly.Install the control valve bodyassembly-(1). Note:Ensure proper alignment of the detent assembly to the detentlever assembly with position switch while tightening the bolt. Thedetent assembly can move and hit the valve body assembly that couldcause improper engagement with the detent lever assembly. Install the manual shaft detentassembly-(2). Note:Install all bolts before tightening, then tighten inspecified sequence. Install the 8-control valve bodybolts-(1) M6-x-65 and tighten to12-Y(106-lb-in).Install the 2-control valve bodybolts-(3) M6-x-55 and tighten to12-Y(106-lb-in). Install a NEW control solenoid valve assembly filterplate-(1). 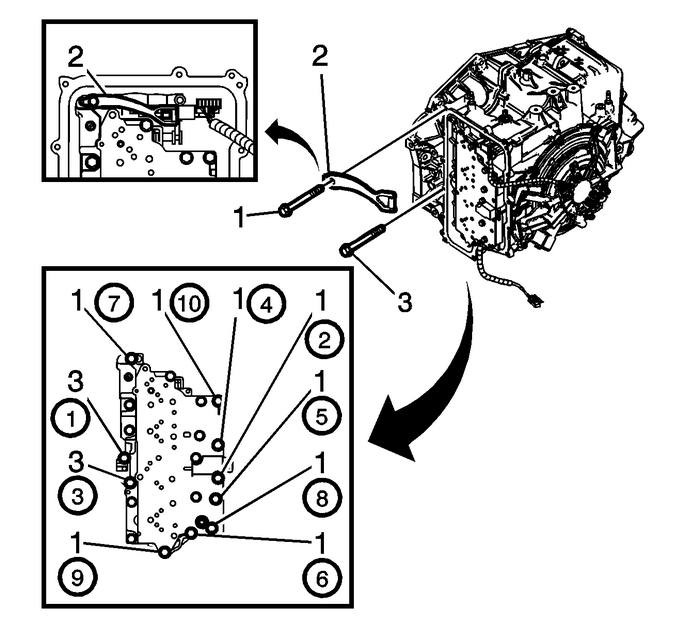 Install the control solenoid valve body and TCMassembly-(5).Rotate the control solenoid valve spring-(7) intoposition. Install the 4-control valve bodybolts-(1) M6-x-80.Install the control valve body bolt-(6)M6-x-55.Install the 3-control valve bodybolts-(2) M6-x-95.Install the control valve body bolt-(3)M6-x-42.Install the 2-control valve bodybolts-(4) M6-x-65 and tighten to12-Y(106-lb-in). Connect the input speed sensor electricalconnector-(1).Connect the output speed sensor electricalconnector-(2).Connect the shift position switch electricalconnector-(3).Install the control valve body cover. Refer toControl Valve Body Cover Replacement.For transmission control module programming and setup. RefertoControl Module References. 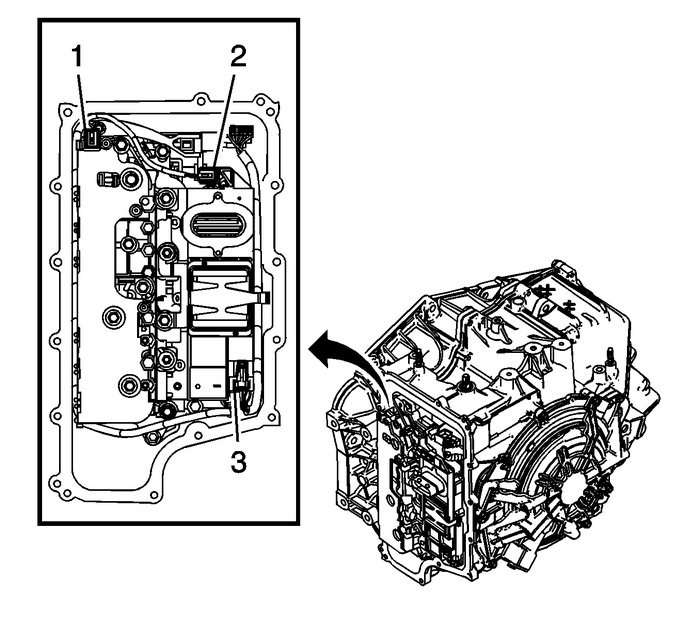 Note:After an internal transmission repair or internal partreplacement the Reset Transmission Adapts procedure should beperformed. Perform the Reset Transmission Adapts. Refer toReset Transmission Adapts.